Add some flair to your show gear with the Rambo Grand Prix Competition Sheet. Highly technical materials give you a waterproof and cozy competition sheet. Highly stylish colors coordinate with the rest of the Rambo Grand Prix line. Rambo Grand Prix Competition Sheet is rated 4.8 out of 5 by 6. Rated 5 out of 5 by wannabeagypsy from So pretty and practical, too Bought this for my spooky warmblood who hates the static in Santa Fe . Its pretty good at not making too much static .Although it is fleece lined it doesnt shock him too much. The biggest bonus is the pretty plaid pattern on the inside which I didn't notice when I looked at it on the website.It seems super well made. He's a red brown bay and it and looks very smart on him. Rated 5 out of 5 by Juniper from Nice quarter sheet Quality material. Reversible. Nice fit with cutout flanks for your leg to contact your horse well. Got the XL for warmblood, slightly large but fits well enough. Definitely recommend. Rated 5 out of 5 by Lahwk from Great cooler Perfect, cute inside plaid lining, durable material. Snug fit doesn't fly off even in the wind. Love it! Rated 5 out of 5 by MoJoe from Awesome so far! I absolutely love this quarter sheet it's quality is great especially for the price. The only downside is that the clasp on the tail strap jingles a little bit when I trot but it doesn't seem to bother my boy much soo oh well because its great to do everything in including jumping. Rated 4 out of 5 by CRex from Good fit! Not black! Hair sticks! 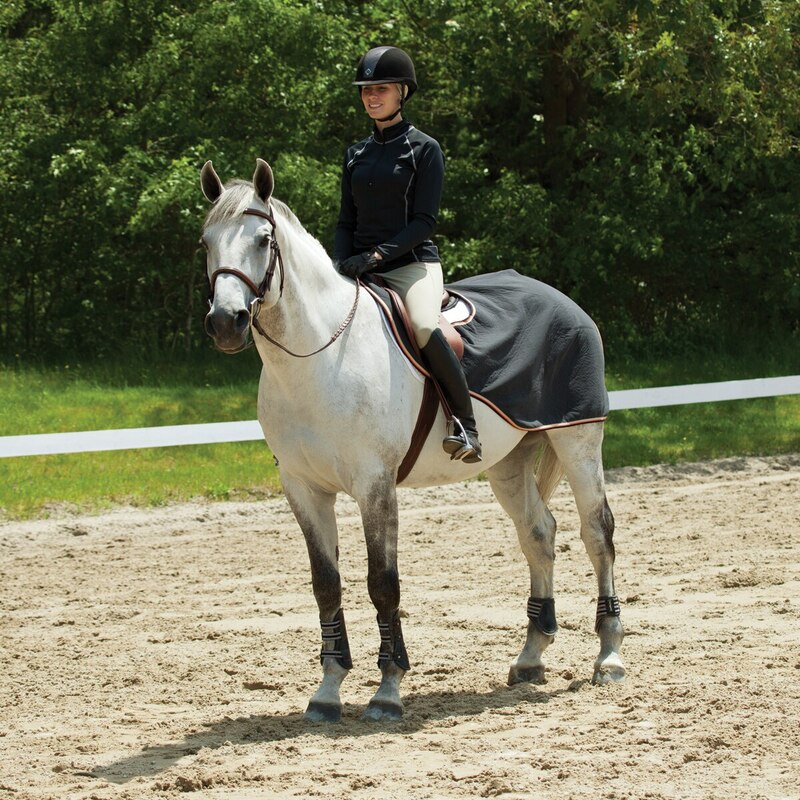 This quarter sheet fits my horse very nicely - he's normally a 78 in sheets/blankets so the large is perfect. The "black" is really a slightly unusual grey - almost a grey with a brown touch. We like it and it functions well - great leg contact and we don't notice it at all while flatting or jumping ... but hair sticks to it a lot! And there's a big plastic rubber sewn-on brand tag that's not very attractive right by where we had a monogram done. So while we like the fit and function, the hair sticking and color aren't so great. Rated 5 out of 5 by alg006 from Love this quarter sheet I was initially nervous about ordering this quarter sheet. I had never seen one in person and so was worried that since the fabric is waterproof, it would be crinkly and loud when I rode. I was so pleasantly surprised when I received this-the material is like a soft shell ski jacket, fairly soft and very warm, but doesn't have the static issues like traditional fleece does. I have only ridden in it once, but was really excited when I did ride in it. 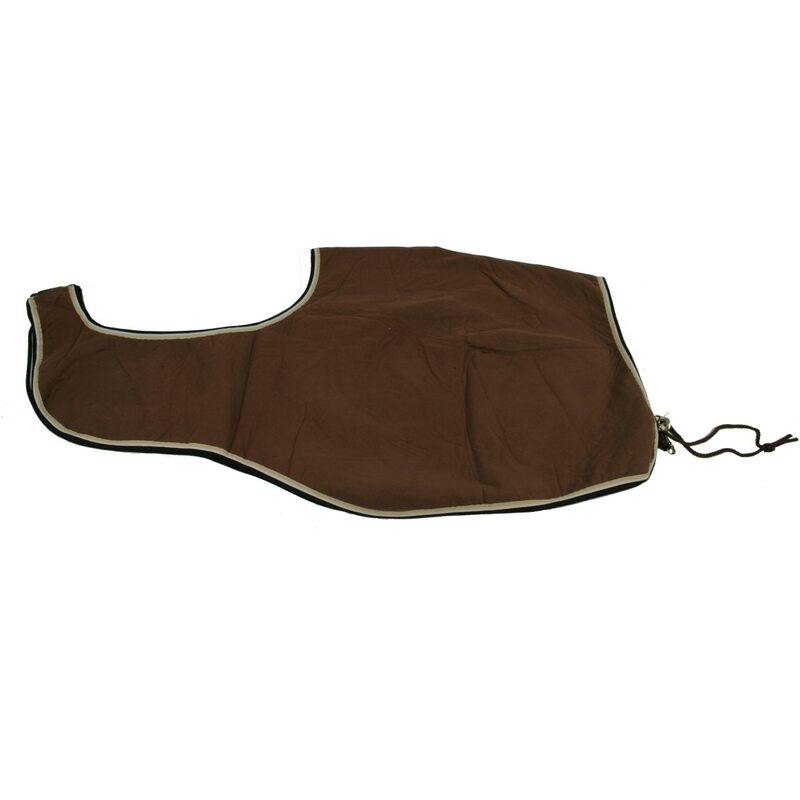 My fleece quarter sheets flap when I canter, and pull at times around the saddle. This one did not do that AT ALL. No flapping! I didn't even notice that my horse had a quarter sheet on! I will be ordering another one in a smaller size for my mare, and I also am saving for the coolers in the same material. I can see that the fabric would be excellent for repelling shavings and dirt when they are in their stalls drying out. The sheet is a bit big, but fits true to size for Rambo type blankets (which in my experience all run on the large side). I have not washed it yet to see if there is any shrinkage.